Sara Carter was born Sara Elizabeth Dougherty on this day, July 21, in 1898, just north of Copper Creek, Wise County, Virginia. She was one of five children born to William Sevier and Nancy Elizabeth (Kilgore) Dougherty. One day when Sara was sixteen, she was standing in the front room of her Aunt Susie Nickels’ house in Copper Creek. She was playing her autoharp and singing “Engine 143,” an old song she’d learned as a little girl. A knock came at the door, which Aunt Susie answered. It was 21 year old Alvin Pleasant Delaney Carter from Clinch Mountain. He had been walking towards the house, looking to see if Mrs. Nickels (the mother of Alvin’s mother’s cousin) would be interested in buying a fruit tree or two from the nursery that he worked for. The singing A.P. had heard coming from inside the house had quickened his step. Aunt Susie welcomed A.P. in. He entered the front room and stood, listening. When Sara finished her song, he said to her: “Ma’am, that was might pretty playing and singing, and I sure would like you to play that over again for me.” So Sara did. A.P. Carter and Sara Dougherty were married on June 18, 1915. That’s Sara on the right, A.P. in the middle and Maybelle on the left. On July 31, 1927, The Carter Family drove the 26 miles from Maces Springs, VA to Bristol, TN. They had an audition on August 1st for Ralph Peer, the traveling talent scout for Victor Records. Peer had set up a “recording station” on “the second floor of the building formerly occupied by the Taylor-Christian Hat company” at 408 State Street in downtown Bristol. The Carters recorded four songs at the August 1st session: “Bury Me Under The Weeping Willow,” “Little Old Log Cabin By The Sea,” “Poor Orphan Child” and “The Storms Are On The Ocean” Peer was so impressed that he invited them to come back the next day. Sara and Maybelle did and recorded two more songs: “Wandering Boy” and “Single Girl, Married Girl.” All of these performances featured Sara’s vocals. On November 4, 1927, Victor Records released the first record by The Carter Family from those Bristol sessions. The song on one side was “Poor Orphan Child,” with vocals by Sara and A.P. The song on the other side was “Wandering Boy,” with Maybelle on guitar and Sara singing and playing autoharp. Even though Sara and A.P. 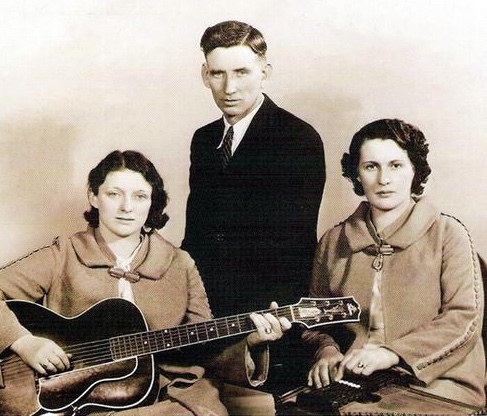 separated in 1933 and ultimately divorced in 1936, The Carter Family performed and recorded together into the next decade. They did their last recording session for RCA Victor in October, 1941 and finally disbanded in March of 1943. The Carter Family was inducted into the Country Music Hall of Fame in 1970. Sara Dougherty Carter passed away on January 8, 1979 in California. The information and quotes in this post came from the wonderful book: Will You Miss Me When I’m Gone? by Mark Zwonitzer with Charles Hirshberg, 2002. This entry was posted in Posts with Video, This Historic Day In Music and tagged A.P. Carter, Bristol Sessions, Maybelle Carter, Ralph Peer, Sara Carter, The Carter Family, Victor Records, Wandering Boy. Bookmark the permalink. A very interesting story- thanks for sharing!